WEDDINGS IN TAHITIElaborate as a royal event, or as simple as an “I do” on all white sand beach…a Tahitian wedding ceremony* is for many a dream come true. There’s no more enchanting way to exchange vows, celebrate an anniversary, or promise yourself to your loved one, than one of these traditional Polynesian celebrations. 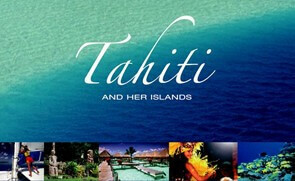 Weddings in Tahiti are an unforgettable event and will create a memory to last a lifetime. Here are a sampling of the many options available. Please contact one of our travel consultants for further details. The romantic “Intimate Tahitian Ceremony” unfolds beachside on the hotel’s motu. Serenaded by a Tahitian trio, the bride and groom exchange tiare leis and receive a wedding blessing from a Tahitian priest. Afterward, they are presented with a tapa wedding certificate and wrapped in a tifaifai, a handmade wedding quilt. The “Traditional Tahitian Wedding Ceremony” is modeled after the Intimate Ceremony and includes a Tahitian dance group with musicians that will sing and dance to the newly wedded couple’s joy during and after the ceremony. A bottle of champagne and a bed of flowers await the couple when they retire to their room. A “Mini Polynesian Sunset Wedding Ceremony” takes place on a beach decorated with flowers, palms and torchlights. Serenaded by musicians and dancers, the bride awaits outrigger canoe. After exchanging tiare leis and being baptized with Tahitian names, the couple are wrapped in the traditional tifaifai wedding quilt and presented a tapa wedding certificate. The ceremony ends with a dance and farewell song before the bride and groom return to their bungalow where champagne and canapes await them. The “Traditional Polynesian Wedding Ceremony” includes all of the above plus a group of dancers, singers and musicians that performs a 30-minute show. Following the ceremony, the couple retires to their room or bungalow where the bed has been decorated with Tahitian flowers, and champagne and canapes await them. The “Traditional Polynesian Te Tama Ceremony” takes place on the hotel’s lovely beach, decorated Polynesian style. The bride and groom are dressed in traditional Polynesian wedding pareos. A group of dancers and musicians serenade the couple with traditional love songs. A Tahitian priest unites them in a traditional ceremony, baptizing the couple with Tahitian names and wrapping them in a tifaifai wedding quilt. Following the ceremony, the couple returns to their bungalow where a beautiful arrangement of tropical flowers adorns their bed. Champagne and wedding cake await them. The “Te Arii Ceremony” includes all of the above plus a gastronomic dinner for two at the resort’s Noa Noa Restaurant. “Royal Wedding Ceremony” InterContinental Resort and Thalasso Spa Bora Bora. “Traditional Tahitian Wedding Ceremony” In the tropical garden by the lagoon, musicians and villagers greet the couple with traditional love songs. Vows are exchanged before a Tahitian High Priest (Includes 24 photos). The ultimate wedding in paradise! The bride, dressed as a Tahitian princess, the groom as a chief, are married by a Tahitian priest in a re-enactment of an ancient ceremony. Vows are exchanged at a stone temple, to the songs and dances of the local villagers. Adorned in flower leis and hei, the couple are presented with a tapa marriage certificate, souvenir photos, and toast their happiness with champagne. For an even more* “royal” wedding*, the groom arrives in a canoe. 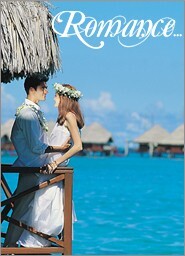 Tahitian dances, a romantic lagoon cruise with musicians and champagne add the finishing touch. “Tahitian Wedding Ceremony” As musicians and dancers serenade, the groom arrives by outrigger canoe at the decorated white sand beach, where the bride greets him. After the ceremony, the couple enjoys an outrigger canoe excursion with traditional music by the paddlers. A romantic dinner at Otemanu Restaurant is included. 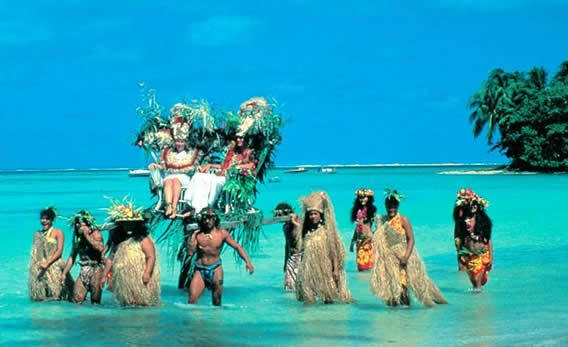 “Traditional Polynesian Ceremony” The beach ceremony with musicians and dancers is performed by a Tahitian priest. The “Te Ruau Ceremony” takes place on the white sand beach. The bride and groom, dressed in wedding pareos, arrive in outrigger canoes as musicians and dancers welcome them. A Polynesian wedding coordinator blesses the union, giving each a Tahitian name. The couple are wrapped in a tifaifai, a Polynesian wedding quilt. A fruit basket and honeymoon bed of flowers await them in their bungalow. “Traditional Ceremony” The ceremony is conducted by a Tahitian priest at sunset, amid coconut palms and flowers. The couple exchange flower leis and heis, accompanied by Tahitian songs and dances. *Weddings featured here are not legal ceremonies. Couples intending to marry legally can do so before arriving in Tahiti, then exchange vows in one of these traditional ceremonies. For legal weddings, also see Fiji Weddings, Cook Islands and Hawaii. Prices listed are USD and subject to seasonal changes.